Ahmedabad chapter of the Indian Association of Investment Professionals (IAIP) organized an event titled “Alternative Investments – The Regulatory Landscape in India, Future of Hedge Funds, New Products and the road ahead”. The speaker for the event was Jainendra Shandilya, CFA, CAIA, Assistant General Manager, Enquiry and Adjudication Department, Securities and Exchange Board of India (SEBI) and an active volunteer of the IAIP. Jainendra is working with SEBI since January 2008 and has earlier worked with Bank of India. He has authored several newspaper articles and has been a guest speaker at various national and international seminars on matters related to securities market. He was also a visiting faculty at various colleges in Mumbai and also at the Bombay Stock Exchange Training Institute. The event started off with Bharat Rathi, CFA, welcoming the participants and introducing Jainendra. Jainendra structured his talk into 3 parts: (1) Alternative Investments – Regulatory Scenario in India (2) Couple of products in Alternative Investments (3) Hedge Funds. He started with explaining Alternative Investment Funds (AIF), what they are and how they are technically defined as per regulations. AIF as a concept is relatively new in India as compared to mutual funds that is evident from the fact that India introduced regulations for MFs in 1996 while regulations w.r.t. AIFs were introduced only in 2012. AIFs are required to have a minimum corpus of Rs.20 crore with each investor investing a minimum of Rs.1 crore. However, there is an exception to this minimum investment per investor rule for investments made by the employees of AIF who may be allowed a relatively lower amount of investment per investor. Maximum number of investors in an AIF cannot exceed 1000 and any AIF cannot raise money for the fund through making a public offer. AIFs are of three categories in India viz. (1) Category I – Includes funds which invest in start-ups / SMEs as early stage investors or funds which invest in specific sectors, which are critical for the economy like infrastructure, (2) Category III – which includes AIFs which use diversified and complex investment strategies and also use leverage for making investments, these funds typically include the hedge funds (3) Category II – Any AIF which does not fall in category I or category III is classified as category II. Regulations do not allow Category I and Category II AIFs to deploy leverage as a source of investment, however the same is allowed in case of Category III AIFs subject to maximum cap of 2x on leverage. Jainendra then turned to second topic of discussion – Alternative Investment Products. Emphasizing that there are vast number investment products available in the alternative investments space, he particularly focused on two such products – Green Bonds and Cat Bonds. Green Bonds are debt securities issued to finance investments in business activities that reduce the carbon footprint / other environment friendly business activities, or investment in assets that would have an overall positive impact on the environment as a whole. Jainendra informed that Green Bond is a relatively recent concept with European Investment Bank being the first to issue such bonds in 2007. Subsequently, issuers like World Bank, Toyota, etc. have also issued Green Bonds. In India, private sector banks like Yes Bank and Axis Bank have issued Green bonds. He also talked about a concept called ‘Greenwashing’ which is a term used to refer to investors being fooled by Green Bond issuers through the Green label of these bonds – i.e. while the bond issue may claim to use the issue proceeds for ‘Green’ activities, the actual end use of these proceeds may not be for ‘Green’ activities. To prevent being fooled through ‘Greenwashing’, Green bond investors may insist for third party certification of Green Bonds. He also discussed about ICMA Green Bond principles as well as about third party certification organizations like Cicero, DNV, etc. While there are no regulations for Green Bonds at present, the growing popularity and scale of Green Bonds being issue would likely result in regulatory agencies coming up with regulations for Green Bonds. Jainendra also talked about Cat Bonds that are insurance linked securities tied to natural disasters. Any catastrophic natural disaster would result in provisions of Cat Bonds being invoked and associated payouts would reduce the returns on these bonds. However, considering that the probability of occurrence of such natural disasters being low, Cat Bonds have typically given returns in the range of Libor + 3%-20% over a three year tenor. Cat Bonds provide high diversification even in stressed market conditions. However, Cat Bonds normally have a low rating of around BB+ and have less liquidity. While liquidity is an issue, the associated risks are transparent and well known to investors. Payout probability of Cat Bonds is low – typically 4 out of 120. 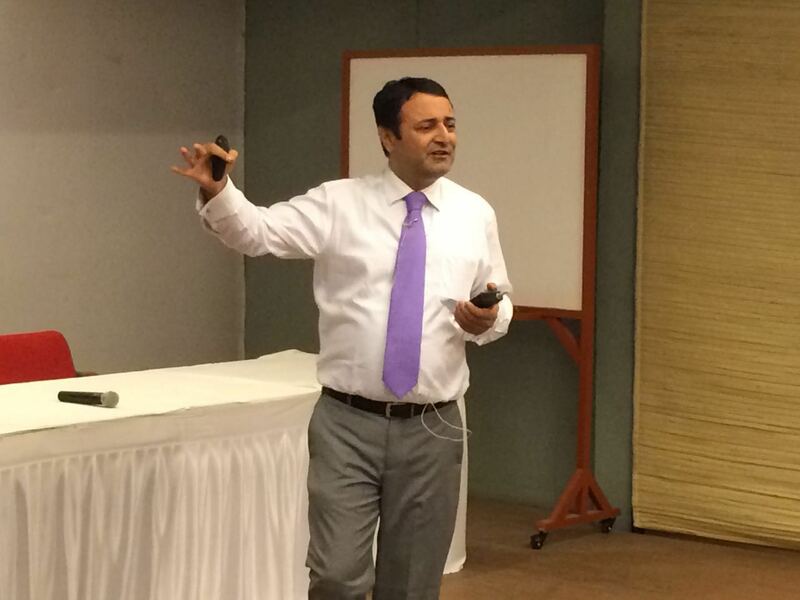 Then Jainendra turned to the final topic of his talk – Hedge Funds. Hedge Funds typically deploy complex, risky strategies having high potential of returns. Considering the vast number of hedge funds (around 10000 in number) which are available in the market with many of them shutting down and many new funds entering the market every year, Jainendra emphasized on the importance of the abilities of a fund manager to produce good returns in case of hedge funds. Selecting an efficient fund manager is the most important factor while selecting which hedge fund to invest in. He further talked about hedge fund types like long / short funds, macro funds as well as event driven funds. The investor base of hedge funds is dominated by institutional investors; viz Sovereign Wealth Funds, Pension Funds, Fund of Hedge Funds etc. However, he emphasized on the fact that share of institutional investors in hedge fund investments has been reducing off late. Jainendra discussed about the top 10 performing mid size and large size funds as ranked by Bloomberg. In case of mid size funds, 8 out of the top 10 performing hedge funds deployed long / short equity strategy while the balance two where macro funds. Most of these top 10 funds are active in Asia, which signifies the importance of this region in the global scheme of things. He also discussed fund managers of these top performing funds like Ping Jiang, Koh Hoi Wong, Vikram Kumar, etc. He showed an AV of Vikram Kumar, fund manager of TT International, speaking about some of his top investment picks and through this, he emphasized that a good hedge fund manager must have the insight to take investment decisions, which may not go with the trend, but which produce sound returns. Jainendra also discussed about how Vikram could make good money for his fund by shorting the British Pound prior to the outcome of Brexit referendum. However, off late, hedge funds have come in for a lot of criticism and negative media attention on account of decisions / statements by several top institutional / individual investors with regard to risks associated with hedge funds as well as associated costs in terms of high management fees and carried interest. Top pension funds like CALPERS, PFZW (Netherlands), NYCER, etc. have voiced their concerns against hedge funds and have started reducing their investments in hedge funds. Several disturbing trends in the hedge funds space like the suicide of a hedge fund manager Sanjay Valvani after being charged for insider trading practices. He also observed that top investors / fund managers like Warren Buffet, Bill Gross, etc. have also voiced their wariness with regard to hedge funds and this has created a negative sentiment in the market, against the hedge fund sector. Considering that the hedge fund returns over last few years have been lower vis-à-vis the returns on S&P 500, such negative sentiment against hedge funds has grown further. However, HNIs, endowment funds and sovereign wealth funds are still investing large amounts in hedge funds. Further, hedge funds typically deploy strategies which are not in sync with the market and hence, the returns may not always be in line with market returns. Bharat concluded the programme by presenting a vote of thanks. Participants then proceeded for dinner. This entry was posted in Ahmedabad, Events, Speaker Events and tagged AIF, Bharat Rathi CFA, CALPERS, Greenwashing, IAIP, ICMA Green Bond, Jainendra Shandilya CFA, NYCER, PFZW, Sanjay Valvani. Bookmark the permalink.